Last Thursday, Taliesin took us on another wonderfully-weird meta adventure, this time through the dark and twisted world of Vampire: The Masquerade. Here’s a few interesting things we’ve collected for this first part. Taliesin: Roll stanima. Actually, just roll stanima. Sam: I think he thinks it’s stanima. Marisha and Taliesin: Stanima, yeah. Marisha: Just straight stanima. Taliesin: Yeah. F*** off. (1:11:15) Taliesin: Make a stanima, stanima, stanima roll. (1:57:10) Sam: Straight stanima. Taliesin: Straight intelligence test, you f***er. Thanks to @samazkma for this art piece! Despite the crash course we took over the weekend, we’re not overly familiar with this system or setting. Additionally, so much of Taliesin’s adventure thus far has been homebrewed and designed as an introduction to The Masquerade that it’s a little difficult to nail down the various creatures making an appearance (except for the obvious werewolves). It’s also difficult to figure out to which clans each member of the cast belonged at this time without more information, beyond a few educated guesses (That said, Matt was almost certainly a Lasombra, barring homebrew/inside joke shenanigans). We do, however, have each of the still-living cast’s first vampire disciplines. 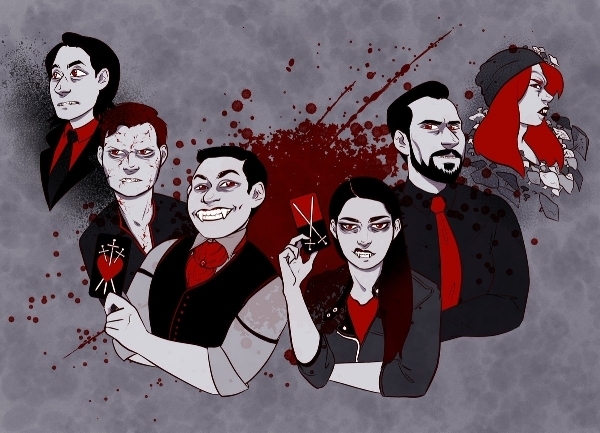 Disciplines determine which powers a vampire has, and give hints as to their clan, since each clan is traditionally skilled in different disciplines. Note that it is possible for a vampire to be trained in a discipline outside those traditional to their clan (at the Storyteller’s discretion), so use caution when making guesses about clans from these alone! Liam: Presence. Vampires with this ability are adept at manipulating the emotions of others. We saw Liam make use of Awe to persuade Travis and Laura into protecting him, and Dread Gaze to attempt to terrorize Arcade into holding still long enough for Liam to bite him. Higher-level abilities can more directly influence a target’s actions, affect groups of people, and allow the vampire to get a sense of the emotions of an entire city at once. Laura: Obfuscate. This is the stealth of the vampire world. Vampires trained in this set of skills can stand in the shadows completely unnoticed, or, as we saw Laura do, seem to disappear almost entirely using Unseen Presence. Higher level skills allow vampires to conceal their aura, other creatures, or even entire buildings, and can allow them to hide themselves in ways other than simply seeming to disappear. Sam: Celerity. Vampires with this discipline move incredibly quickly. Unlike the other disciplines, this is more of a passive skill set, allowing vampires to auto-succeed certain speed-based skill checks and take multiple actions per turn without dividing their dice pool. Higher level abilities grant devastating attacks and the ability to run up walls and across ceilings. Travis: Auspex. This gives a vampire uncanny sensory abilities, and at higher levels, telepathic and psychic powers. We saw Travis use Heightened Senses in multiple instances to hear and see more than he would have otherwise been able to, and Aura Perception to test Amy and to figure out why Liam wanted Laura to protect him. Marisha: Unknown. Marisha did receive a discipline from Taliesin, but died before she got to use any of the abilities associated with it. Matt: Unknown. Matt never received a discipline from Taliesin before being turned to ash. Explosion- Everyone else remaining in the building. Thanks to @weaselbusiness for this art piece! (0:00:49) Taliesin: This game, and the World of Darkness, Werewolf: The Apocalypse, Mage: The Ascension, Changeling: The Dreaming, all of these games. (0:03:12) Sam: I have composed a rap in the style of Sir Mix-A-Lot. (0:05:24) Travis: Colville’s amazing. Olivia Samson. (0:05:33) Taliesin: We’re going to be doing Slave Labor Graphics on Wednesday Club: Johnny Homicidal Maniac and all sorts of gothy comic books for Halloween. (0:07:15) Taliesin: You’re still in Batman. (0:07:31) Taliesin: CR podcast is now available through Amazon Alexa, apparently…. It’s available on Amazon Echo, Echo Dot, Echo Plus, and other Alexa-enabled devices. (0:22:17) Marisha: What do rats like? Taliesin: Disney films…. Amazon gift cards. (0:22:26) Taliesin: Are you going to do the Pirates of the Caribbean *whistle*? (0:22:29) Liam: *Mickey Mouse voice* Oh! (0:23:36) Sam: All I see is wood! Have we gone inside Wyrmwood? (0:25:05) Liam: F***ing Chobot! Taliesin: We’ll get to that. (0:32:47) Taliesin: This is the most WB Vampires since the WB Vampires. Travis: Yeah, I’m gonna start throwing glitter on your carpet. (0:33:34) Taliesin: It’s way too good-looking to be part of the Thrashtopia set. Matt: So it’s in Papyrus. (0:36:57) Liam: Get that paper. Matt: I have some serious paper FOMO right now. (0:40:06) Marisha: Babe, we should look out for those Warcraft props. (0:43:13) Laura: Are there Lucky Charms in the cabinet? Taliesin: There are for some strange reason Lucky Charms in the cabinet. (0:45:28) Matt: It’s probably MSI. (0:46:34) Marisha: This is like some Buffy s***! (0:52:07) Liam: Is this a Geek & Sundry thing or an LDN thing? (0:53:46) Matt: So is this like an amalgamation of many parts or is it like one giant, pulsating Tetsuo thing? (0:59:15) Liam: I voice Doctor Strange; you love Doctor Strange! (1:05:25) Taliesin: Lego Hardwick has been propped up in front of a red velvet curtain. (1:10:30) Marisha: Ashanti, but Ashanti? (1:14:15) Liam: For their wedding, I bought a big block of tickets to Hamilton. (1:17:29) Taliesin: It is not a nice shoe. It’s a definitely like a Ross Men’s For Less shoe. (1:20:20) Sam: I watched True Blood. (1:20:37) Most: *singing* Good vibration! (1:45:45) Liam *Snagglepuss voice*: Oh, exit stage right, even. (...) Heavens to Murgatroyd! (1:53:00) Taliesin: It’s a replica knife that seems to be pretty solid. It’s a Lord of the Rings replica elf knife. (1:55:27) Laura: I’m playing Resident Evil. (2:07:27) Taliesin: You have found some World of Warcraft prop swords. (2:08:00) Laura: I stick that in my belt like I would a Ren-Faire. Taliesin: Ren-Faire style. Liam: Stay away from Port-a-Potties. (2:14:57) Taliesin: They obviously raided a terrible Nerdist shoot for Cheetos and whatever. And, weirdly, yet another box of Lucky Charms. I don’t know why we have so many of them. (2:21:59) Taliesin: It’s like Yahoo Serious hair. (2:57:32) Liam: You think we’re at Burning Man right now, don’t you? (3:00:22) Taliesin: They’ve got a bunch of props from the last run of Sagas of Sundry. (3:01:17) Sam: He’s seen The Lost Boys, I know that’s true. (3:01:33) Taliesin: That body glitter. It’s kind of nuts. Liam: Magic Mike. (3:01:52) Liam: It’s a Death Note! (3:03:46) Sam: It was like a Brunello di Montalcino wine. (3:38:40) Taliesin: He’s getting a little Baba-Yaga. Liam: Baba-duken! (0:14:43) Laura: Do I want to eat the rat-ish? Liam: Radishes are good. Travis: Do you like radishes? Sam: Spicy. (0:22:17) Marisha: What do rats like? (…) Liam: Snitching. (1:10:24) Taliesin: It is not sun tea, it is Sean Tea. Ashanti. (3:00:35) Travis: I was going, a beef steak? (3:13:40) Liam: I bet that smarts.